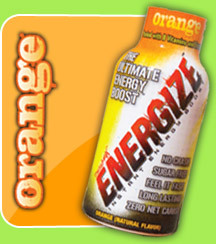 ENERGIZE is a 2-ounce energy drink that provides hours of energy, alertness and focus with no crash and no jitters. It contains a healthy, powerful blend of B-vitamins and amino acids. There’s zero sugar, zero net carbs and only four calories. It contains about as much caffeine as a cup of coffee. What will ENERGIZE do for me? Imagine what you could do with more energy. You could be alert and productive in the morning. You could be wide awake after lunch instead of groggy. You could have plenty of energy for working out or going out. You’ll definitely see less of your couch. Then again, you won’t miss it. You’ll be too busy doing the things you really want to do. ENERGIZE contains a blend of ingredients unique to energy drinks – B-vitamins for energy, amino acids for focus and better mood. The unique part is what's NOT in a ENERGIZE shot. There’s zero sugar, zero net carbs and zero herbal stimulants. It contains only as much caffeine as a cup of coffee, and just four calories. What flavors does ENERGIZE come in? 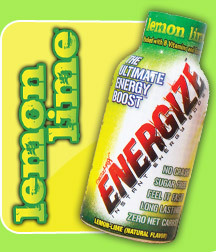 ENERGIZE is currently available in two flavors –lemon-lime and new orange. 8500% Vitamin B12? 2000% Vitamin B6? Isn't that dangerous? Not at all. In fact, the levels of Vitamins B12 and B6 are well within safe limits. The RDA (Recommended Daily Allowance) is minimum daily amounts set by the Food and Nutrition Board of the Institute of Medicine. This board also sets upper limits for consumption. According to the Linus Pauling Institute at Oregon State University, "No toxic or adverse effects have been associated with large intakes of vitamin B12 from food or supplements in healthy people." As a result, no upper limit for intake has been set. Doses as high as 1,000mcg are used to safely treat pernicious anemia. ENERGIZE contains 500mcg. Doses of vitamin B6 higher than 200mg per day over an extended period have been shown to cause side effects. The Food and Nutrition Board has set a safe upper intake level of 100mg per day. However, ENERGIZE contains only 40mg of vitamin B6. So, even though ENERGIZE appears to contain extremely large amounts of vitamins B6 and B12, they are within nationally recognized safe limits. Has ENERGIZE been approved by the FDA? The FDA categorizes products like ENERGIZE as "dietary supplements." Government rules for supplements differ from those established for synthetic medicines. All dietary supplements must comply with DSHEA (Dietary Supplement Health and Education Act) regulations for labeling, manufacturing practices, and use ingredients the FDA categorizes as GRAS (Generally Recognized as Safe). The FDA does not test and approve dietary supplements because their ingredients are already established as safe. ENERGIZE contains safe levels of vitamins, amino acids, and other nutrients recognized as safe by the FDA. If ENERGIZE contains zero net carbohydrates, from where does it derive its energy? ENERGIZE works to provide mental alertness, focus and improved mood rather than physical energy. This is why it's as effective for office workers or truck drivers as it is for endurance athletes. It keeps the office worker bright and productive during that afternoon lull. It keeps truck drivers alert and focused during the monotony of long distance travel. And it keeps athletes' heads "in the game." ENERGIZE can be used in conjunction with carb boosters during sports. Can I take ENERGIZE if I am currently taking medications? Always check with your physician before taking ENERGIZE with prescription medicines. While other energy drinks contain both caffeine and guarana (a tropical berry that contains three times as much caffeine as coffee), ENERGIZE contains caffeine comparable to a cup of the leading premium coffee. Limit caffeine products to avoid nervousness, sleeplessness, and occasional rapid heartbeat. Is ENERGIZE safe for diabetics? ENERGIZE contains no sugar, so it is safe for diabetics. However, be sure to check with your doctor before taking ENERGIZE if you have concerns about how it may affect you. Who should not take ENERGIZE? Do not drink ENERGIZE if you’ve been instructed by your physician to avoid caffeine or stimulants, or if you have concerns about taking it. Not for use by children under 12 years of age. How many bottles of ENERGIZE can I take per day? We recommend taking no more than two bottles per day. Be sure to space them several hours apart. Is ENERGIZE safe for women who are pregnant or nursing? We do not recommend ENERGIZE for women who are pregnant or nursing. It contains as much caffeine comparable to a cup of the leading premium coffee plus a variety of stimulating vitamins and amino acids that may be passed on to a baby. We recommend consulting your physician for ways to deal with fatigue while pregnant or nursing. Is ENERGIZE safe for people with high blood pressure or heart disease? If you have high blood pressure or heart disease we recommend consulting your physician before taking ENERGIZE.